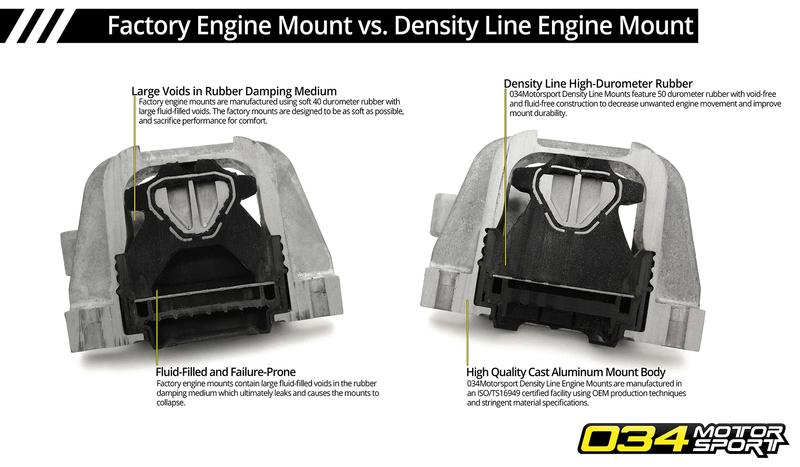 034Motorsport is proud to introduce Density Line Performance Engine/Transmission Mounts for 8V/8S Audi A3/S3/TT/TTS & MkVII Volkswagen Golf/GTI/R! 034Motorsport's Street Density Mounts for MQB platform vehicles deliver unmatched levels of comfort and performance. Density Line Drivetrain Mounts are engineered with performance in mind, and provide an OEM+ driving experience without sacrificing comfort. Density Line Mounts are fluid-free, and manufactured from high-durometer rubber to significantly improve performance and longevity over factory mounts. By eliminating the slop associated with the stock mounts, the Density Line Mounts reduce wheel hop, improve response, and offer a more direct, connected driving experience. The Street Density Engine Mount Pair is manufactured from 50 durometer and 60 durometer rubber, which is approximately 25% stiffer than stock. Since the mounts are also solid-filled, the result is a substantial reduction in drivetrain movement versus the factory mounts. Rubber does not pack and wear as quickly polyurethane does, which ultimately results in a longer-lasting part with consistent performance and comfort.